We pick up our car at the long-term parking lot near Orly Airport at 10.30 pm after our flight back from Malaga and drive the two hours back to Blois with no mishaps. Closerie Falaiseau is safe and sound with no break-ins (you never know in this day and age what might happen) so we unload the car and turn on the electric blankets. The temperature in the bedroom is 15°C. Jean Michel brings up the portable oil heater. You can see the round window on the right just opposite the street light! 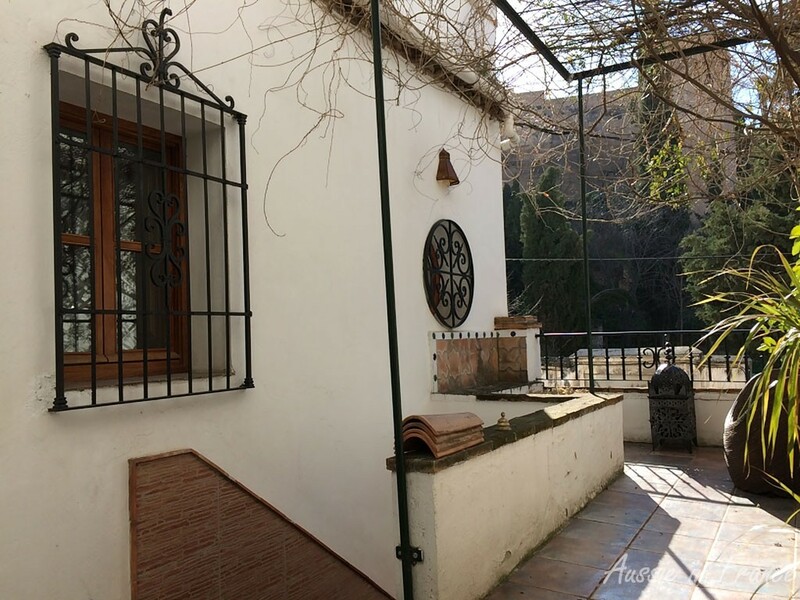 I sleep like a log, most unusual for me, but there are no cars going over the cobblestone outside our house on the Double Hill and no light streaming into the enormous round unshuttered bedroom window from the street light as there was in Granada. Everything is perfectly still and quiet. 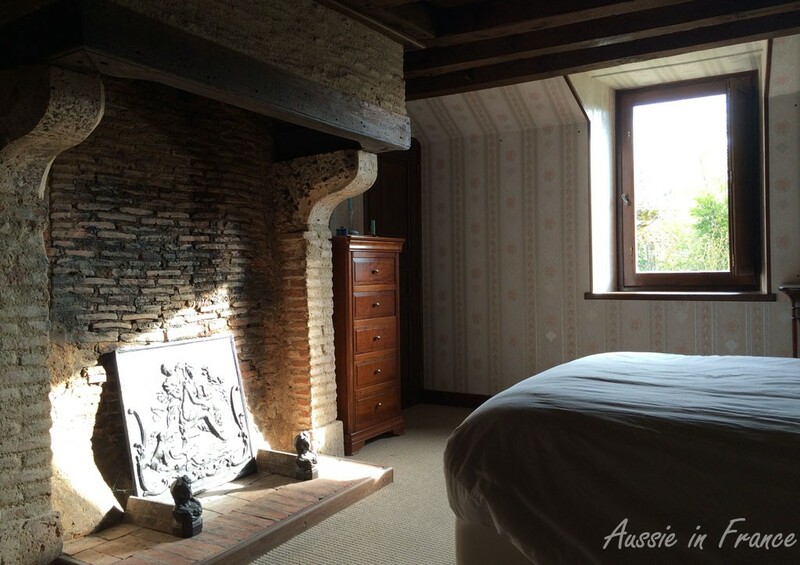 Bright sunshine in our bedroom – after we open the shutters! 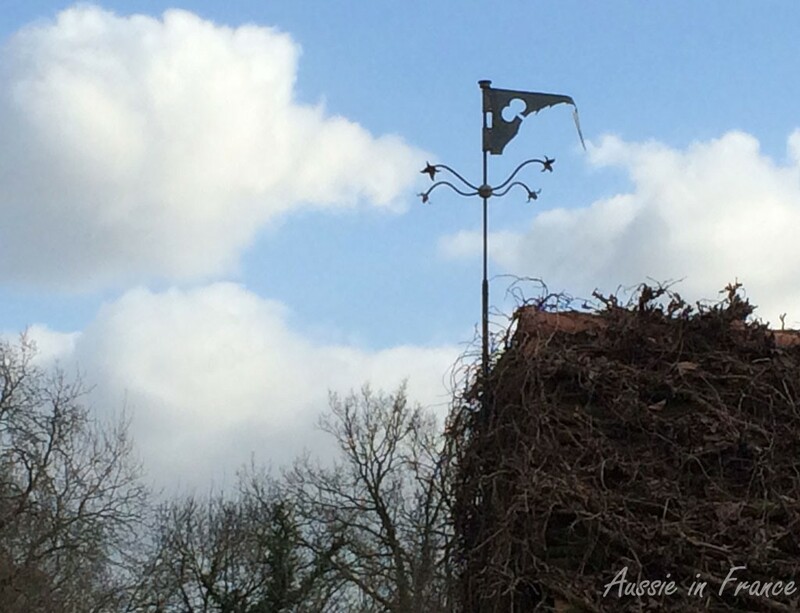 The first thing Jean Michel notices when he opens the window in the morning to bright sunshine is that our weather vane is broken. 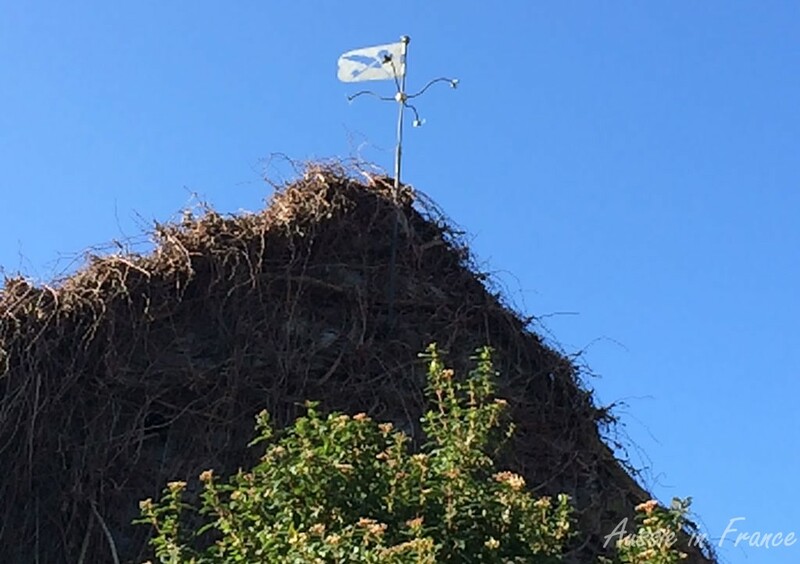 We have a beautiful, unique weather vane on one of our barns, made by our previous owner who was a locksmith. It has a key to represent his trade and a feather to symbolise that of his wife, who was a secretary. Both are perfect symbols for us as well. We can also see the weather vane from the upstairs living room so can check which way the wind’s blowing when we’re having breakfast. In France, north winds are chilly and south winds are warm. But one side of the weather vane is now looking as though it might fall off altogether. 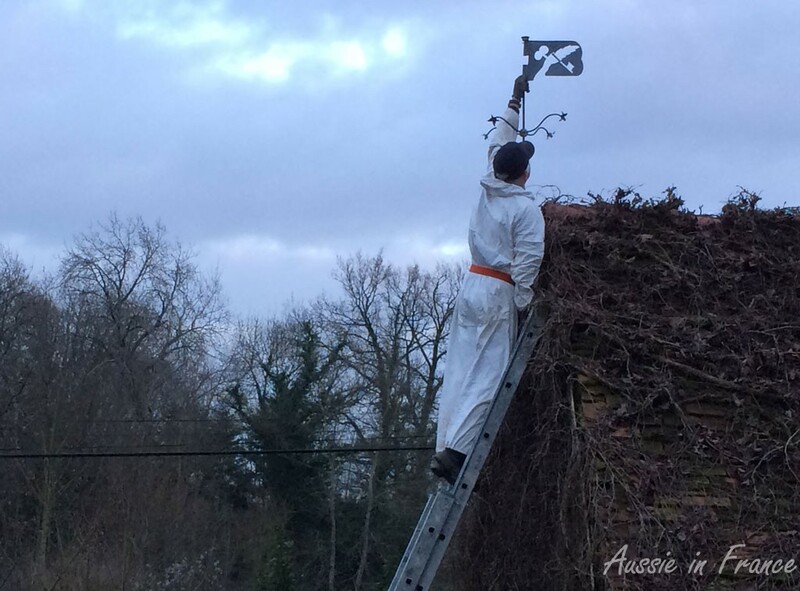 Jean Michel waits until late afternoon when the wind dies down and it’s a bit warmer so he can climb up his big ladder and bring the weather vane down for repairs. I don’t like heights but he has even done a special course in climbing up on roofs so I’m not too worried. He unscrews the weather vane from its little pole and climbs carefully down the ladder. 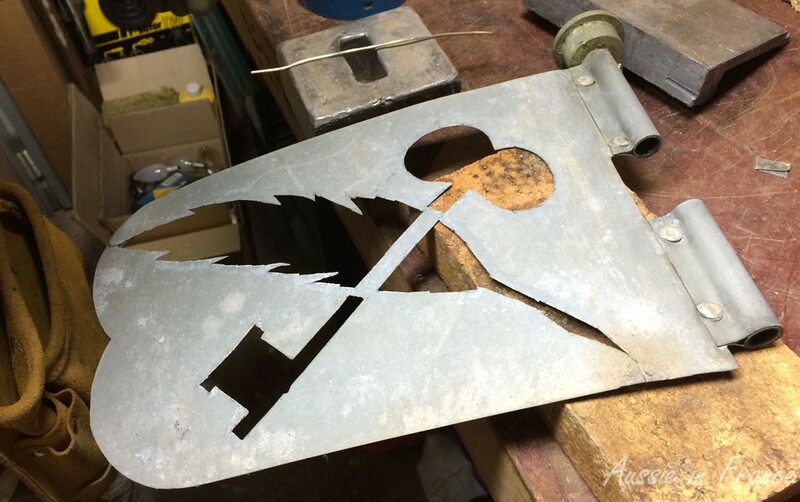 The repairs prove to be a bit more difficult than expected because the weather vane is zinc and he is using galvanised iron to fix it so the solder isn’t behaving very well. However, he eventually finds the solution and it is soon repaired. 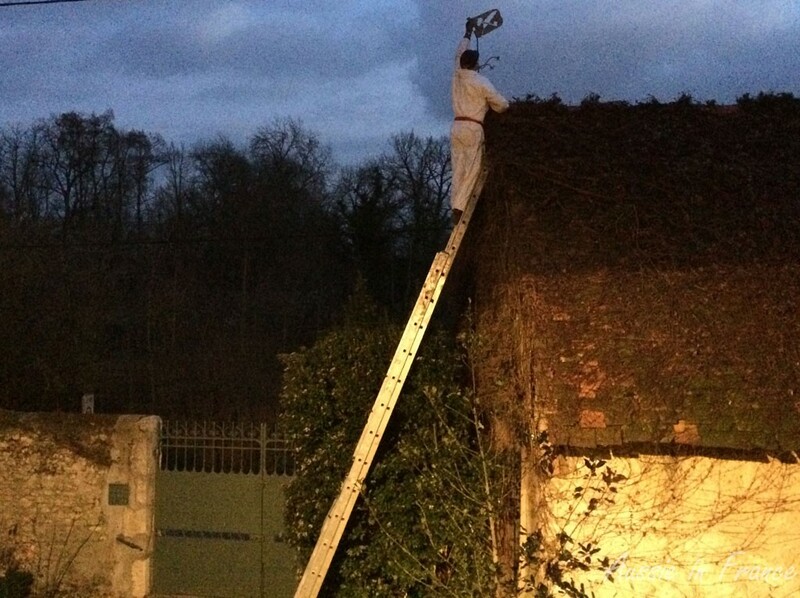 However, it is nearly dark by the time he climbs up the ladder again and I’m just a little worried this time. But all goes well and it’s soon in place again. I have to say that I am extremely lucky to have such a talented husband. He really does seem to be able to fix anything! 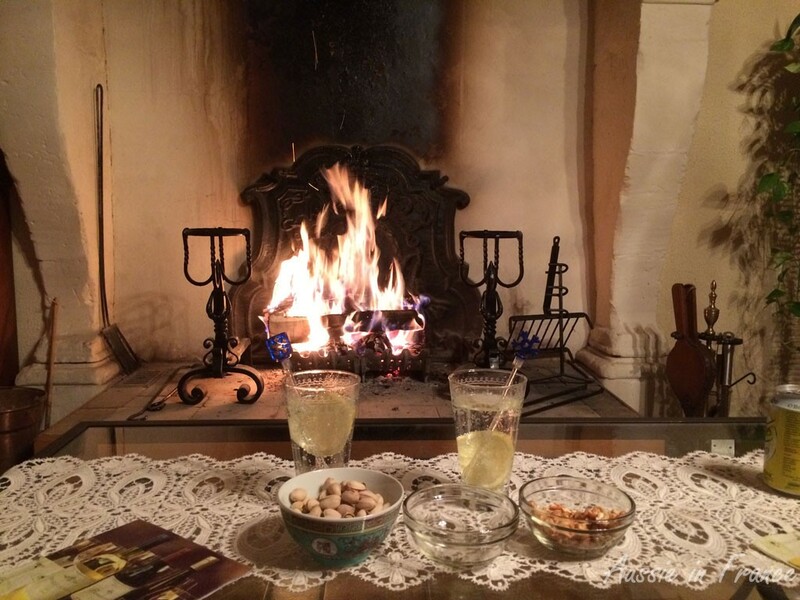 He certainly deserves a gin and tonic in front of the fireplace after his hard work. Gin & tonic to make up for the one that Transavia airlines doesn’t serve in-flight! And just in case you’re wondering how I am health-wise, this awful flu is still not completely finished even after nearly three weeks. I’m still very tired and have a cough but am able to translate and rake the moss off the lawn when I need a break. However, I’ve fared better than my neighbour who still isn’t out and about. I hope that next week we’ll both be back to Nordic walking together. 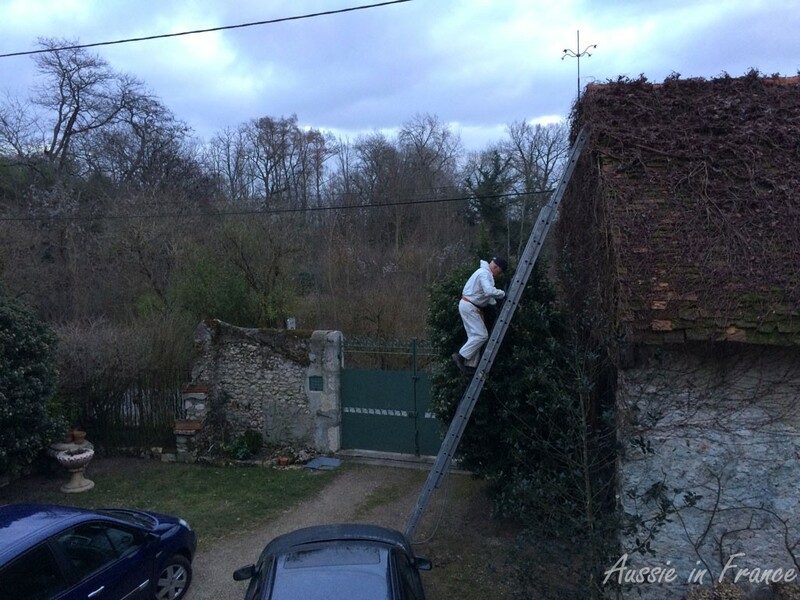 This entry was posted in Art, Closerie Falaiseau, Life in France, Renovation and tagged repairing a weather vane. Bookmark the permalink. Well done Jean Michel. I too would attempt to climb the ladder to make the repair, if it meant I could sit in front of that wonderful fire. Fortunately, I can have it without climbing the ladder! Very good of Jean Michel. We love renovating things from the past. Such a shame to throw them away. Gin-and-tonic is our standard in-flight drink but Transavia doesn’t serve it! the reason I ask is that we’ve the roofers in doing the longere and they are using zinc for the guttering.. and the old guttering that has come off is the colour of that vane… whereas, all the oldish lead I have come across gets darker and darker. 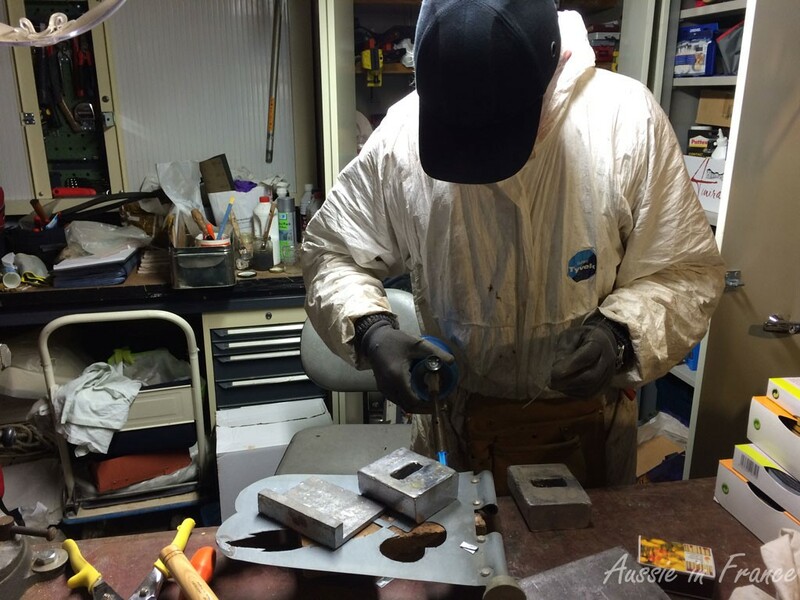 once I’ve built my atelier!! You are perfectly right of course, Tim, and I’ve replaced “lead” with “zinc”. I do hope that you make yourself a weather vane as well. Good luck with the atelier. Yikes! That ladder business scared me just looking at it. What a handy husband you have!!! I love the weather vane and am glad to see it is back in service! The first time I saw him climb on the roof, I couldn’t bear to look. I’ve become inured. I’m impressed with JM’s handiness too. I know what you mean about this wretched virus. In Paris there was a public notice saying if you have bronchitis go and see your GP. I still have what feels like a golf ball sitting in my chest. I think I will have to go to the doctor and get something to knock it on the head. At least the extreme tiredness has gone, but I’m still really headachy. Goodness, then it must really be considered lethal. I know what you mean about the golf ball. Mine seems to have disappeared. I hope we’ll all be up and running again for the Saffron Fair next weekend! Rosemary, you are indeed very lucky to have someone like JM who can do so much – we don’t have the same handy skills in our household. I’m sorry to hear you are feeling under the weather. I seem to remember around this time last year a flu hit you really bad as well, yes? I hope you can rest up, stay warm and will soon be fighting fit again. Thanks Carina. I may have had the flu last year (I can’t remember now) but it was nothing like this one! I hope none of your family gets it. It seems really lethal.